This was the 55th car to pick us up and the 55th time I’d heard this comparison. The three youngsters looked at each other scratching their heads. No one ever knew Richard Gere. Hitchhike number 55 had started like every other: the surge of elation that followed being picked up was a welcome respite from the tedium of waiting. The feeling of satisfaction that we were about to chip another tiny chuck out of the 20’000 km of road that separated us from the green pastures of Shropshire had made us eager to get to know our new hosts. We were in the car with a trio of teenagers: a couple in the front and another boy in the back. Both the boys had a feathery adolescent moustache and the girl had her long black hair tied in a pony-tail plat. Michael and I took turns to fire questions at them from our Lonely Planet phrasebook. Every one of them was met with cries of glee from our hosts –a kind of innocent enthusiasm that never failed to affect us. Between the questions, I took the time, as I often did, to gaze at our surroundings; consciously attempting to commit as many of the different landscapes as I could to memory. It’s perhaps a strange, circumscribed way to experience the world, speeding past you from behind a car window. It was as if a great Bayeux Tapestry was unravelling at 90 km p/h as we leapfrogged our way through the continent, from car to lorry to car. We had been picked up in a remote town called Jiayuguan, about 628 km from the next site of discernible civilization, . If you look at the shape of China as a chicken, we were deep in the tail feathers. The lush tropics of the South Pacific were a distant memory and the further we headed north and west the colder and emptier the landscape had become. After The Sandy Desert, in Australia, I’d say The Gobi is the second most aptly named desert in existence. Its name means “waterless place” and, indeed, it is a notoriously greedy desert with an insatiable thirst for fertile land. It is expanding south, year after year, devouring as much as 3,600 km2 of grassland each time. We’d also noticed that the further we’d headed north and west, the more the people seemed to absorb the characteristics of their environment. Up until Xian, the local people had been, at times, overwhelmingly generous, friendly and open. Since then, however, the inhabitants of colder, miserly more ruthless lands had become just that. It was with increasing frequency that drivers would demand exorbitant amounts of money to give us a ride. We’d been in the car for about two hours and we seemed to be exactly smack bang in the middle of nowhere. One of the dubious joys of hitchhiking is that you’re at the mercy of the whims of your host. Usually these whims pertain to generosity, friendliness or benevolence but not always. 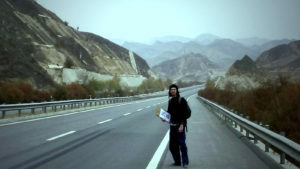 Hitchhiking sometimes manifests the darker sides of human nature as well, as we were to soon find out. The boy in the back had been studying the phrasebook for a while, mesmerised. Michael was similarly engaged, listening to his iPod. His hair had grown wild and unwashed, his beard like a nest of dry, ginger straw. He looks like a caveman, I thought, which in hindsight proved to be an ominous reflection. I suddenly realised that all three of our hosts were starting at me, even the driver. Looks of curiosity/bewilderment were ingrained into their youthful faces. We were probably the first westerners they’d ever seen in the flesh. They considered us for a few moments more, before a debate broke out between them. The couple in the front were discussing something of importance – or perhaps they were arguing – it was difficult to tell. The only thing I could count on was that the subject was us; it was obvious from the intermittent glances in the rear-view mirror. The boy next to Michael passed him the phrasebook and Michael duly pulled out his earphones. “Huh?” he said, as the boy pointed to a phrase. Michael read aloud the phrase, which was apparently in the shopping section of the book. My attention flittered for a spit second to the other side of the highway –I thought I’d seen a car but it was merely the sun, now low in the sky ahead of us, reflecting momentarily from a sign. He’d been asked this question a few times before. The boy looked at the iPod but shook his head. He pointed to the phrase again and then gestured at the space all around us to indicate the car. I could see the driver’s face in the mirror break into a grin. “How much is the car?” asked Michael, with a knitted brow. It dawned on me what was about to happen. We didn’t mind paying drivers for our rides sometimes. If we were in a country where it was customary to do so, the “when in Rome” motto seemed a reasonable course of action. If a fee was requested, it was usually negotiated before we got into the vehicle. We always armed ourselves with the knowledge of the price of a bus ticket between the places we were travelling and, as a general rule, if we were charged anything over that price, we rejected the offer and if it was anything below, we jumped aboard. Up until this point, 8’388 km into our journey, we’d paid for 6 out of 55 rides, from £2.50 to £5. This time I had an uneasy feeling creeping into my stomach. It seemed like these kids had purposely waited until we were at our most vulnerable, the furthest point between where we’d started and where were going. The boy handed Michael a notepad and gestured for him to offer a price. Michael wrote the price of a bus ticket and returned it back. The boy’s eyes widened, squinted and then his eyebrows fell low. He reported the figure to the two in front. The driver snorted in disbelief. They were clearly expecting more. The girl with the long pony tail plat looked out of her window, seemingly disinterested in the proceedings. The driver caught my attention in the rear-view mirror and rubbed his thumb and forefinger together –the one gesture we’ve found to be truly international. Michael returned the notepad again and gestured for him to write a price. The boy said a few words to the driver, who muttered a reply. The girl’s heard jerked back around and she spat a sharp word or two at the driver. Michael and I looked at each other as the girl continued to express her anger in rapid Chinese. The boy in the back wrote a figure, crossed it out, thought for a few seconds, wrote another figure and passed it to Michael. Michael took a look at the number, sighed with a smile and cast his eyes to the heavens. “What is it?” I dared to ask. “You don’t want to know,” he replied earnestly. I took the notepad. The price was one hundred times what we’d initially offered to pay, the equivalent of a week of our budget in China. It looked more like an international phone number. I made eye contact with the girl; she looked again out of the window, not that there was much to see. We’d entered a shallow ravine, with some small, white chalky hills on either side of us. A few heavy moments of silence passed. The driver was the first to break, clearing his throat. He made the familiar money gesture with the hand he wasn’t steering with and then pointed outside into the desert. As if the ultimatum wasn’t clear enough, he slowed right down then pulled over. The girl started complaining again, but the driver silenced her with an aggressive bang of his hand onto the dashboard. I’m not sure what they expected us to do. Perhaps they were only trying to scare us into paying up. We certainly didn’t have that kind of money on us – we’d have been fools to do so. Looking back, perhaps we could have given them assurances that we’d pay up in the next town or perhaps we should have attempted to negotiate a more reasonable price. These things didn’t occur to us at the time. I watched the boy in the back’s jaw fall open in astonishment as I opened the car door and stepped outside. Michael shook each person’s hand and thanked them with more sincerity than I could have managed had I attempted it. As they drove off, with a spin of their wheels on the dusty road, I could hear the girl screeching in high irate tones at what had just occurred. The boy in the back watched us from the rear window until the car disappeared into the horizon. “What did you thank them for?” I asked Michael. I couldn’t resist smiling. Here we were, without any food or water, stranded in one of the most unforgiving environments on earth. 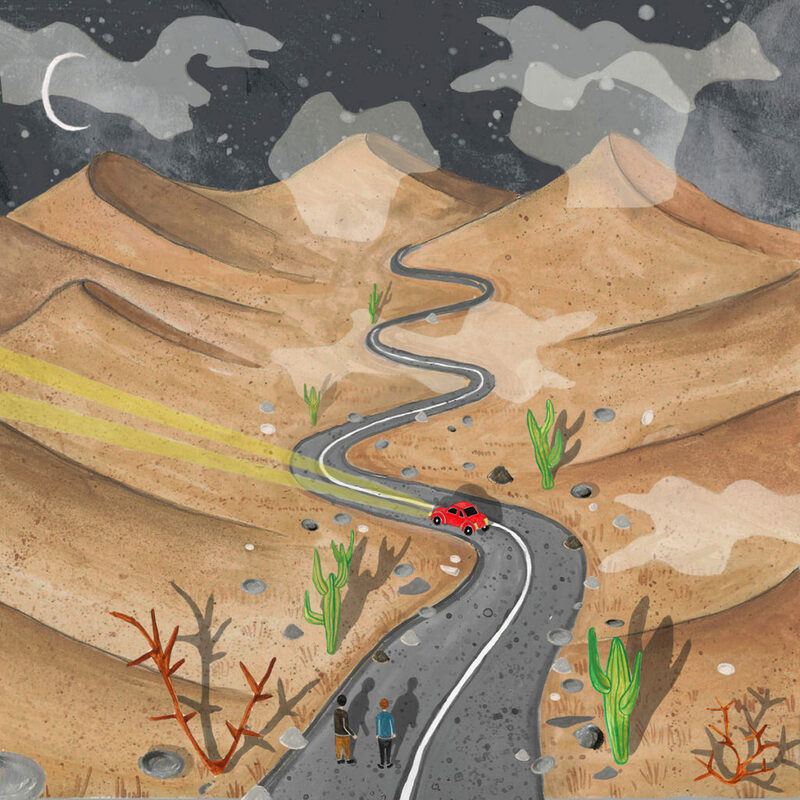 Whilst we’d been driving, deeper and deeper into this barren wasteland of a place, we hadn’t seen a single vehicle on either side of the road. We only had a few hours of sunlight left and the temperatures were reputed to drop to as low as -40C. I couldn’t help but admire and envy Michael’s positivity. The air felt cold in our lungs and loud on our breath as we walked towards the sun which was perhaps a couple of hours away from settling down for the night behind the horizon. We’d left the plateau and had now dropped with the road into a mini valley, with low, chalky hills on either side of us. Despite being barren and largely featureless, our surroundings, cast perfectly in the silent winter sunset, possessed a stark, extra-terrestrial kind of beauty. A few hours later the feelings of hunger were gnawing at our stomachs, the cold was seeping into our bones and tiredness whittling away at our morale. We continued walking for about 30 seconds as his words hung in the air. “Good thinking Michael,” I agreed, pretending that I hadn’t just had a somewhat startling vision of me killing him, eating his flesh, burning his corpse for warmth and then dancing around the cave with the charred remains of his skeleton for a laugh. We heard the faintest of rumblings behind us and turned around. In any other landscape on earth such a distant sound would have been absorbed into the scenery or ignored by the occupants, but here even our hearts sounded like drums in our chests. Squinting into the distance, with the sun behind us, we saw a sparkle of reflected light. “A car! A car! A car!” we whimpered, skipping about. The excitement quickly turned to anxiety, however, at the thought that nothing was guaranteed. This was the first car we’d seen since the trio of teenagers that had picked us up – 4 hours and 300 km ago. Surely, I thought to myself, two random westerners in the desert, 328 km from civilization, would be a compelling enough sight to stop?! Perhaps with the image of my malevolent, cannibalistic grin still fresh in his mind, Michael cast aside any feelings of inhibition and he stepped out of the hard shoulder and onto the highway. With the brazen pride of a showgirl at a boxing match, he held the sign for our next destination, “Hami”, high above his head. I joined him by his side and I summoned from within the depths of my soul the most pitiful look of pleading sorrow that I could muster – my lip quivered, my eyes bulged and swelled with water, my knees shivered and my hands were clasped together in prayer. It was no show. I wanted to leave. The closer and closer our saviour approached, the more and more our excitement grew, and the more we shuffled out onto the highway. “Is he slowing down?” I asked Michael. And sure enough, the car was slowing down. “Damn!” Michael shouted, throwing the sign into the dust. “Well, do you want the good news or the bad news?” he asked me. As we turned from the road, dejected and tired, the thought of the night to come sent a small chill down my spine and the first real thoughts of concern wandered into my mind. How long will it be before we see another car? How long will it be before another car stops? How long will it be before we can eat again? How cold will it be when the sun falls behind the horizon? Will Michael notice if I steal his scarf? Not for the first time on our journey I was thankful not to be alone and my thoughts turned to comfort. Which dusty rock would make a good pillow? Which dusty rock would make a good blanket? Which dusty rock could I brush my teeth with the morning? “I don’t believe it,” said Michael, breaking my train of thought. I turned around and, sure enough, he was right. No yelps of excitement or skipping around this time, however. The bitter taste of disappointment was still too fresh in our mouths. This time it was serious; now or never. We walked right out into the middle of the road and for the first time on our hitchhiking adventure, I think the driver had to stop out of necessity rather than choice. The car slowed down, manoeuvred around us, and then stopped in the hard shoulder ahead of his. We jogged up to the window and, as it opened, a thick plume of cigarette smoke oozed from within. Two pairs of masculine eyes were just about visible, peering at us through the sauna-like haze. Michael pointed at his sign. They shared a few words together then gestured for us to join them. I let the familiar wave of elation wash over me as I slide into the backseat alongside my friend. Whereas usually, however, the feeling was a euphoric affirmation that the highs of hitchhiking round the world outweigh the lows, this time it was more like relief. The driver looked at his friend and they both giggled in mutual recognition. “The hair!” Michael said, grasping a chunk, and they all laughed some more. They stopped laughing and scratched their heads. No one ever knew Richard Gere.